Gator F3B World Cup 2018!!!! on Feb 23, 24 and 25 at Palm Bay FL. The excitement is building for the 8th Annual Gator F3B contest to be held this year at “The Compound” in Palm Bay FL. This is a “must attend” event for all sailplane enthusiasts. Everybody is welcome regardless of your skill level. F3B Radio Control soaring is a multi-task international FAI model contest event that provides an exhilarating experience for RC soaring pilots. To compete at the highest level can be very demanding and requires thermal skills above the average. F3B is a format that has traditionally been more popular in Europe and Australia until recent years when there has been a resurgence of interest and F3B activity in the USA. Since the 2011 USA F3B World Championships in Laiwu China, the USA team has been improving and the GatorF3B contest is a vital part of the Teams training. Details of their daily performance in 2011 China and 2013 Germany and 2015 Netherlands can be found at the official F3B Team Web site. The US Team finished 2nd to Germany in Laiwu, China in 2011 and then 3rd to Germany and Austria in Nardt, Germany in 2013. These were great performances by the US Team that has few chances to compete at the highest level. In fact most European pilots fly in more contests annually than any member of the US Team has flown in their entire life! The Gator F3B contest is designed to attract top level pilots from all over the world to address this lack of contest experience suffered by the US pilots. The inaugural Gator F3B multi-task soaring event was flown in fantastic weather in Feb 2011 as a practice event and fund raiser for members of that 2011 US team. The US Team members and world class competitors from all over USA attended the event. 4 pilots from Germany also came across the Atlantic to participate and catch one of the final Shuttle launches from the Cape. Five local Florida pilots with limited experience also entered and many other soaring pilots were there to assist as helpers during the three days. It was a great opportunity for those who haven’t seen F3B to get involved and try their hand at this most demanding discipline of RC soaring with plenty of experienced F3B pilots to provide assistance. The final results of the contest are here. 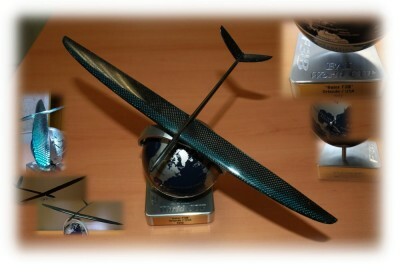 The 2nd annual Gator F3B was conducted on March 2nd 3rd and 4th 2012 as the first World Cup event on the Calendar and attracted the attention of some pilots from Europe who enter in the many Eurotour events. Helmut Edenhofer of Germany came over for the event with his beautiful home molded F3B ships. CD Roman Vojtech was flown in from the Czech Republic to be the Contest Director for the event and the game was on. It was a great and challenging contest with variable conditions including high winds on the Sunday. The eventual winner was Tom Kiesling flying his Fosa with great precision and posting some of the fastest speed times seen by any Fosa. The beautiful 1st place trophy created specially for the F3B World Cup events. The third annual Gator F3B was held on March 1st, 2nd and 3rd 2013. Those in attendance witnessed the most exhilarating soaring ever seen in Florida including the World F3B Speed record broken twice. In very strong conditions on Saturday Mike Lachowski flew an 11:98 in Speed followed by Dave Klein 20 minutes later with an 11:90. The regular cold fronts sweeping across the Florida peninsula all winter can produce some incredibly good F3B soaring conditions with great launching wind and amazing lift. Clearly each year some of the fastest times in the world are flown at this event. If you want to go fast you need to come to the Gator! The 4th Annual Gator F3B was attended by current World Champ Andreas Herrig and past World Champ Andreas Bohlens of Switzerland along with a contingent of other European and Chilean pilots. Roman Vojtech was again the CD and after more than 7 rounds of very competitive flying the event was finally won by our own Kyle Paulson. The 5th Annual Gator F3B was conducted on the West Coast for the 1st time. Flown in Perris CA on Mar 20, 21 and 22 the contest was well attended with 30 pilots and a great team of helpers at Base A and Base B. The event was won by local stalwart David Klien. The 6th Gator F3B was held once again at Cocoa FL where it all began. Though the available field area had been reduced due to construction efforts by the Waste Management people Kyle Paulson arrived early to assist in setting up the course in the best direction for the forecast Norwesterlys. The contest was once again well attended by the West coast contingent and Sandy Smith did a fabulous job of CDing the event for us. 20 pilots attended and the event was won handsomely by Reto Fiolka flying a Pike Precision. 2nd place was Kyle Paulson with Steve Condon making 3rd.